The first half of the 20th century must have been a thrilling time for museum lovers in Egypt; there was a dizzying array of choice for the culturally minded Egyptian or foreign traveller. 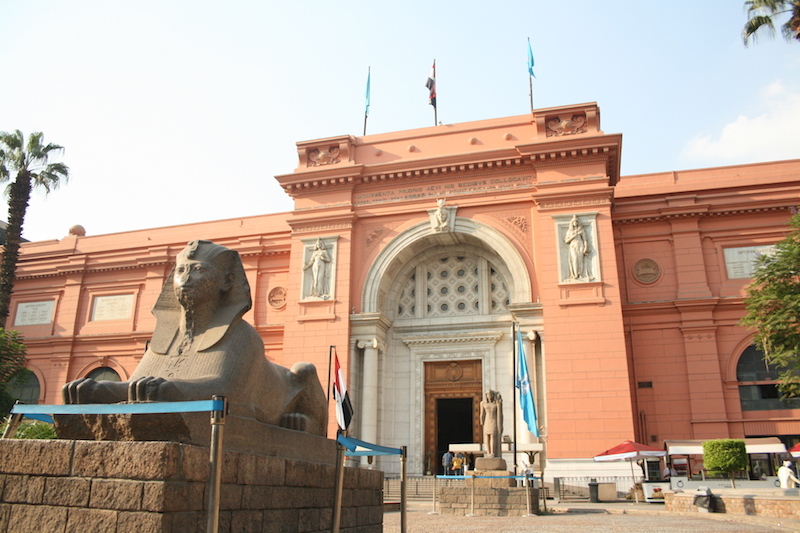 In Cairo, the world’s first Railway Museum opened in 1913, followed by the Agricultural Museum in 1938, and the Postal Museum in 1940. This is to say nothing of the four large museums that are the focus of Donald Malcolm Reid’s new book Contesting Antiquity in Egypt: the Arab Art Museum (now the Islamic Art Museum), inaugurated in 1884; the new Egyptian Museum, which opened its doors in 1902 (moving from an earlier site in Boulaq to what is now Tahrir Square); the Coptic Museum of 1908; and, in Alexandria, the Graeco-Roman Museum of 1892. The book is a follow-up to Reid’s 2002 work, Whose Pharaohs, which charts the early development of Egyptology and antiquarian study in Egypt. His new study picks up where the last left off – at the beginning of the First World War – and follows the story up to the Egyptian Revolution of 1952, picking apart the complex ‘semi-colonial’ period in Egypt’s history. He endeavours to show how it forms the story of these museums as well as the wider study of Egypt’s vast cultural heritage. Reid, who always has a good eye for an anecdote, shows how impossible it is to separate culture from the imperial machinations and rivalries of the time. The Graeco-Roman Museum remained an almost untouched Italian fiefdom, but everywhere else the French, British, and Germans were fighting it out for dominance. The battles tended to be focused around the French and the British. Reid devotes several arresting pages to one of the fiercest rivalries between two famous scholars of Islamic art: K.A.C. Creswell and Gaston Wiet. The British Creswell was convinced that Wiet showed him ‘ten years of underground hostility against an interloper in a field he [thought] ought to be entirely French’, adding that Wiet was ‘the spearhead of French anti-British influence’. Wiet, who had an Egyptian wife and held soirées for Cairo’s most famous writers, frequently bested the irascible Creswell with characteristic sangfroid. Beyond the French and the British, the situation was greatly complicated by the presence of the Germans – who were disliked by many after the First World War, but increasingly determined to spread their influence during the 1930s and ’40s. The Americans were also relative newcomers on the scene, launching an ambitious, but ill-fated bid to spend $10 million on a new Rockefeller Museum on the Nile. However, what Reid does, which so few others do, is use his knowledge of Arabic and the archives of Cairo to chase up the people so often not invited to the party: the Egyptians themselves. Reid delves into sources, which are often ‘scant’ or ‘shadowy’, to create a picture of the Egyptians committed to studying their own heritage and ensuring that Europeans were not the only ones with opinions on the subject. Often patronised or simply ignored by their Western colleagues, these dogged academics had to fight for any kind of recognition. Murqus Simaika, the founder of the Coptic Museum, appears to have devoted his whole life to his beloved project, forsaking all other pursuits. There were many other Egyptian scholars like him: Ali Bahgat in the Arab Art Museum; Ahmed Kamal, Selim Hassan, and Sami Gabra in Egyptology; and Taha Hussein in the cause of Greek history. Egyptology is the main star of the book but it is far from the only one. As well as giving long overdue credit to the unsung, Contesting Antiquity in Egypt shows how great archaeological events, such as the discovery of Tutankhamen’s tomb in 1922, were received in 20th-century Egyptian culture. Two of the great poets of the age, Ahmed Shawqi and Khalil Mutran, wrote poems for the boy-king, warning the British (and Howard Carter in particular) to keep their hands off Egyptian patrimony. Reid shows how Egyptians – now officially independent, if practically under more British control than they wanted – used their newly discovered ancestor to press their own claims. ‘Pharoah, the time of self-rule is in effect, and the dynasty of arrogant lords has passed,’ Shawqi wrote. Reid guides us through the Pharaonic sculpture of artists like Mahmoud Mukhtar, the painting of Ibrahim Nagi, and the cultural debates being played out in the Egyptian press. He also makes brief forays into the Arabic literature of the time (but never seems quite as at home there as he does elsewhere). By the end, one wonders about scholars who could ever write a history that does not include these Egyptians. Since the publication of Whose Pharaohs, Reid’s approach has been very influential. Elliott Colla’s 2007 Conflicted Antiquities has added fascinating discussions of the place of Pharaonism in 20th-century Egyptian cultural output, as has the Egyptian scholar Dr Ahmed Mekawy Ouda. In the closing pages, Reid mentions that in 1981 the busts of famous Egyptologists were moved into the garden of the Egyptian Museum, as a backdrop to the sarcophagus of the legendary French archaeologist Auguste Mariette. Then, ‘the European busts in the pantheon were rearranged to make room for those of five Egyptian Egyptologists.’ Contesting Antiquity in Egypt does the same in scholarly terms. It has not removed the European scholars but, by introducing their previously overlooked Egyptian counterparts, it has allowed us to see the two sides from a different angle, giving a fuller picture of both.